Yay! I did it! I made pasta from scratch and then formed ravioli! I am so proud of myself! I have been very hesitant to try making my own pasta. I had never successfully made fresh pasta when I was eating wheat, so I did not know how the dough was supposed to look or feel. I did try to make wheat pasta once, but it was so bad that it was inedible and I never tried again. I went to a talk by Amy Fothergill at the GF and Allergy Expo in New Jersey. Amy talked about making fresh and store-bought gf pasta, and answered all of our questions. After this I got the courage to finally try making fresh pasta. The GF fresh ravioli I made was absolutely delicious and just like wheat ones in texture. The store bought ones I have tried have been between “pretty good” and “might as well just eat the box”. I have never had GF ravioli that has even comes close to these home made ones. The taste and texture are awesome and totally worth the time and effort. You can make a whole bunch and then freeze some to cook later. I was able to pick up a new pasta machine for $25 at Marshall’s. If you pick up a used one be very meticulous about cleaning it before using it for gluten free pasta. You are not supposed to get the machine wet, so it is very tricky to clean out every trace of wheat flour. You do not have to use a machine at all. Rolling out the dough with a rolling pin will work also. Just be sure to roll it very thin. You should be able to see through the dough. The machine makes it very easy to get the pasta uniformly thin. It did take a long time to make the ravioli. I think the next time, now that I know what to do, it will take less time. After mixing and kneading the dough it must rest for at least a half hour before working with it. The filling also needs time to chill in the fridge for several hours to get firm so it does not run or spread out when you put it on top of the pasta. I decided to make a traditional ricotta cheese filling for the ravioli. You can fill ravioli with many different things such as mushrooms, spinach, meat, squash, pumpkin, lobster etc. The pasta recipe will work with any filling and you can also use it to make other pasta shapes. The machine I have makes fettuccini, tagliolini and lasagna noodles. 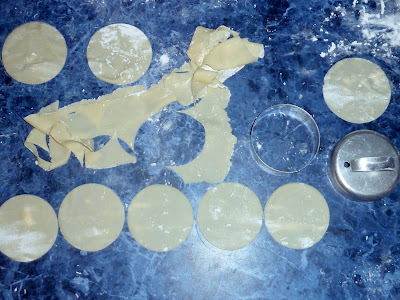 I used the lasagna shaped noodles to cut out circles for round ravioli. I made some tagliolini noodles also. Tagliolini are very thin noodles like angel hair and the dough was easily cut into this thin shape. You can dry the pasta and store it or freeze it fresh and store it. I froze the fresh noodles in a plastic container. With the ravioli I wanted to save for later, I spread them out flat on a baking sheet lined with parchment paper and put them in the freezer until frozen solid. Then I placed them in layers in a plastic box shaped container. I put parchment between each layer of ravioli to prevent sticking. I served the ravioli with my homemade pasta sauce. You can use whatever type of sauce you like. 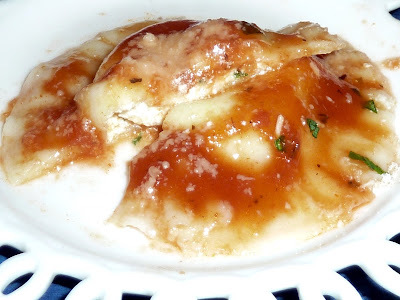 I will make pumpkin or butternut squash ravioli next with sage butter sauce. Yum! 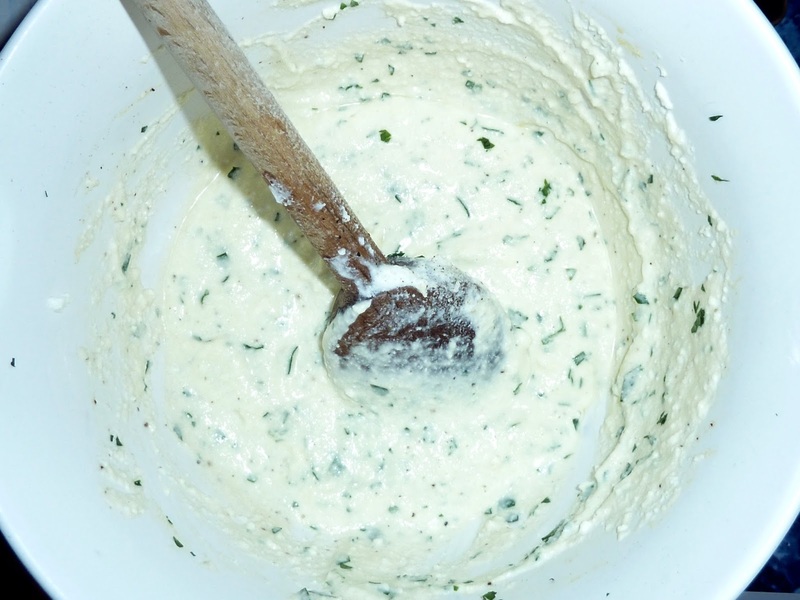 1) First make the filling: Combine all the filling ingredients in a bowl and mix well. Cover and let it chill in the fridge for several hours until firm. Ricotta Cheese Filling before chilling. 2) Next make the pasta: In a large bowl add the dry ingredients and whisk together well. Do not add salt, as this will make the dough tough. It is better to cook the pasta in well salted water. 3) Make a well in the center (you can pile the flour on the counter top and make a deep well also, but I thought the bowl was safer for a first time pasta maker such as myself). Dry ingredients in a bowl with a well in the center. Wet ingredients on the right. 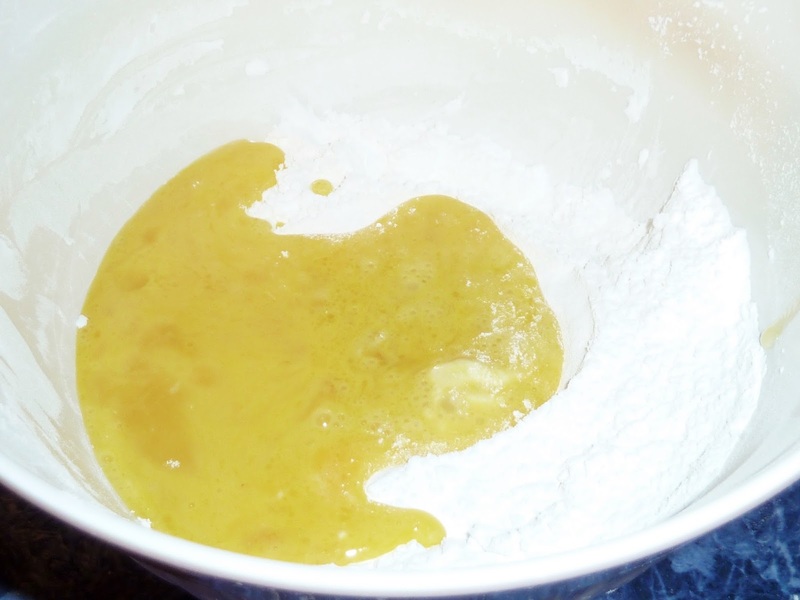 4) In a small bowl mix 3 of the eggs and the oil and pour into the flour well. Wet ingredients poured into the well. I am glad I did not try this on the counter top. Evidently my well was not deep enough. 5) Mix with a fork. 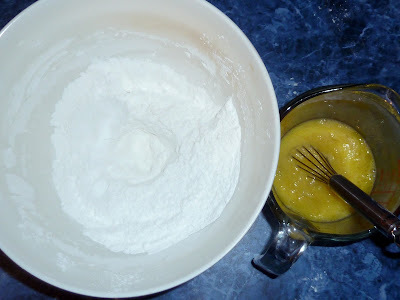 6) Add the water slowly while mixing it in. All of the flour should be incorporated and the dough should hold together. 7) If too dry and crumbly add additional water a teaspoonful at a time until the dough holds together. 8) If too sticky and wet add a tablespoonful of tapioca flour at a time until the dough is soft and pliable and easily holds together into a ball. 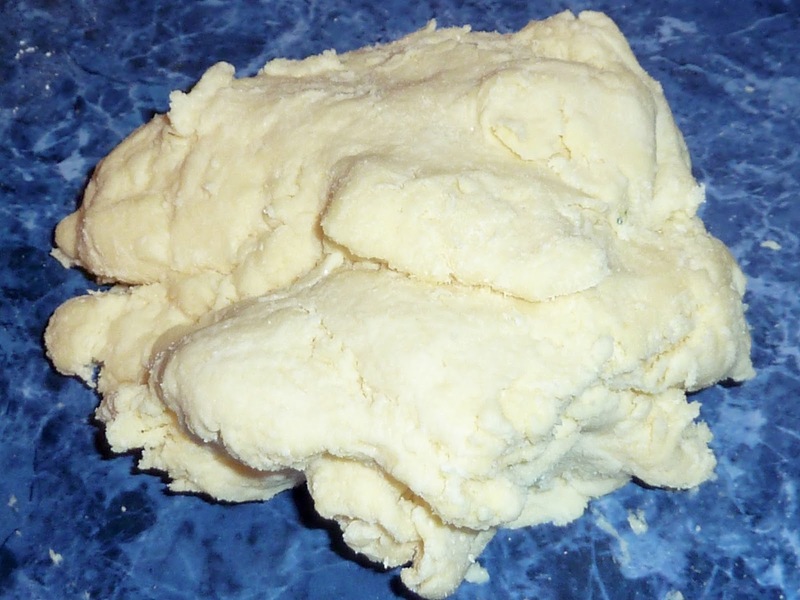 Dough mixed together before kneading. Note how lumpy it looks. 9) Knead the dough, in the large bowl (or on the counter) until it becomes very smooth. Dust with some cornstarch or tapioca starch as needed to keep the dough from sticking to you or the bowl (or counter). 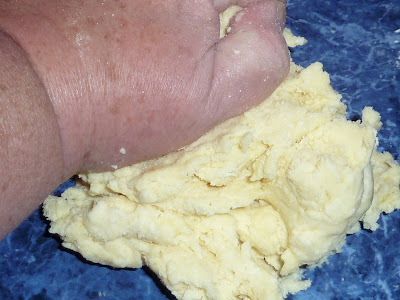 When gently pressed between your thumb and index finger the dough should feel like your earlobe. Kneading the dough on the counter. 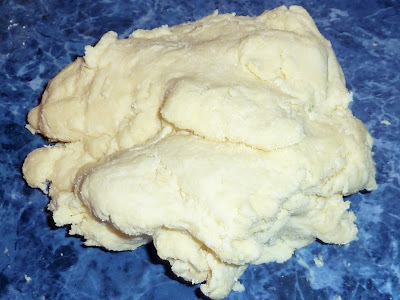 Dough after kneading. Note how smooth it looks now. 10) Place the dough into the bowl (after it has been washed and dried) and cover with plastic or a cloth to keep the dough from drying out. Allow the dough to rest at least a half hour before working with it. Resting the dough allows the flours to absorb the moisture and hydrate. 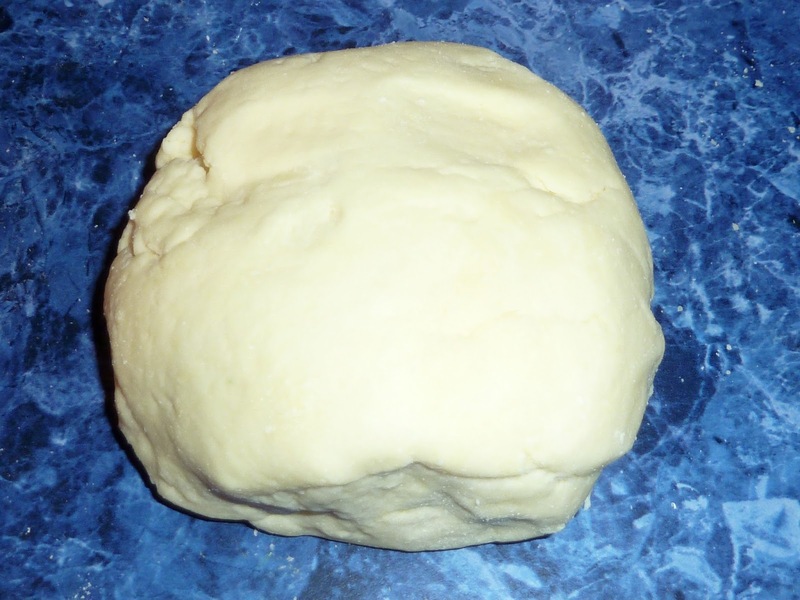 11) After the dough has rested cut the ball into four parts. Take one piece and place on a board or on the counter. Cover the other three pieces to keep them from drying out. 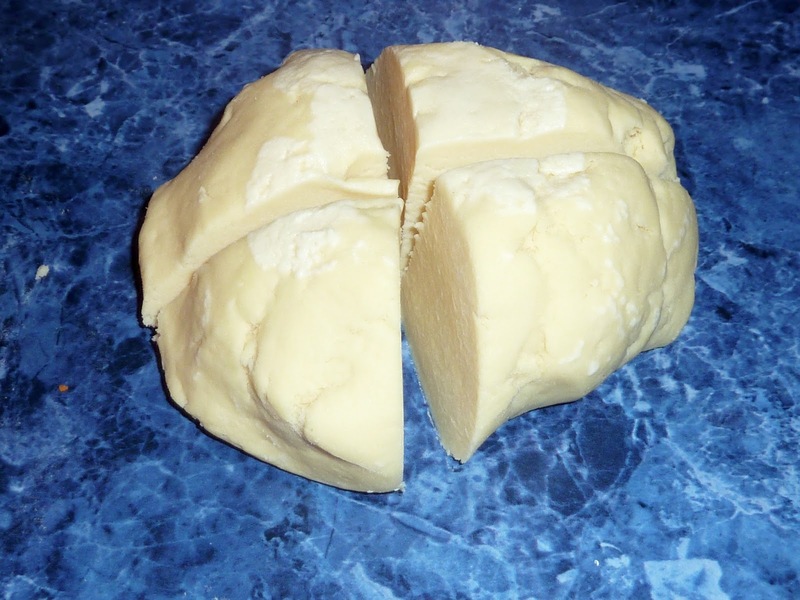 Dough cut into 4 pieces. 12) Flour the board or counter with corn or tapioca starch. If you have a plastic or metal scraper it will come in handy to free any dough that begins to stick to the surface. 13) Pat the piece of dough into a flat elongated disk and “flour” it well. 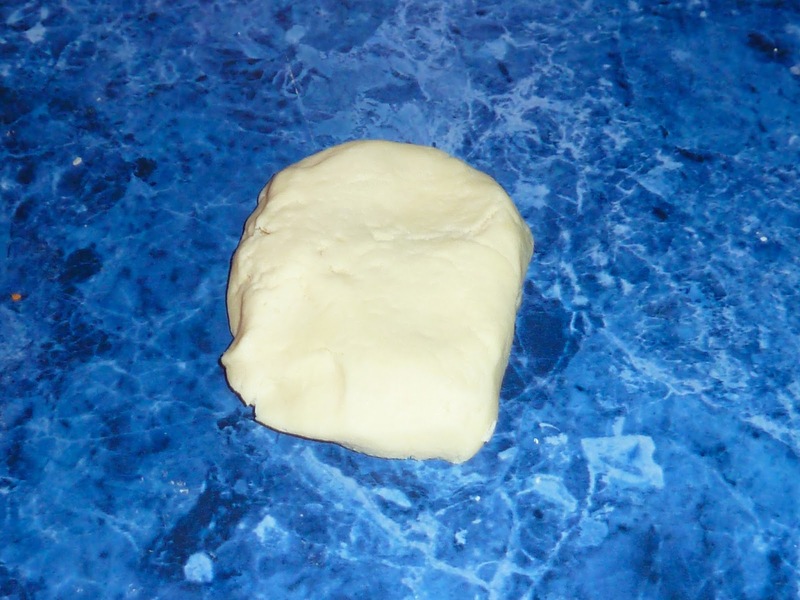 Dough patted into a flat disk with one end tapered to fit into the machine. 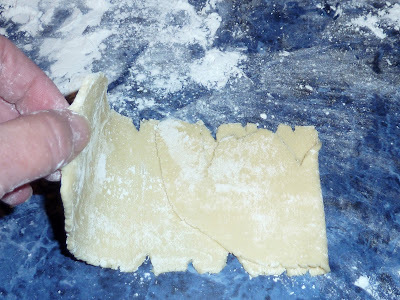 14) If you will be rolling out the dough by hand, roll the pasta out on a well “floured” surface until it is ⅛ inch thick. Check frequently to be sure that the dough is not sticking. Loosen the dough with a scraper and “flour” with corn or tapioca starch as needed. You should be able to see through the pasta (be able to read print that is underneath) when done. 15) If using a pasta machine, set the dial to the largest opening. 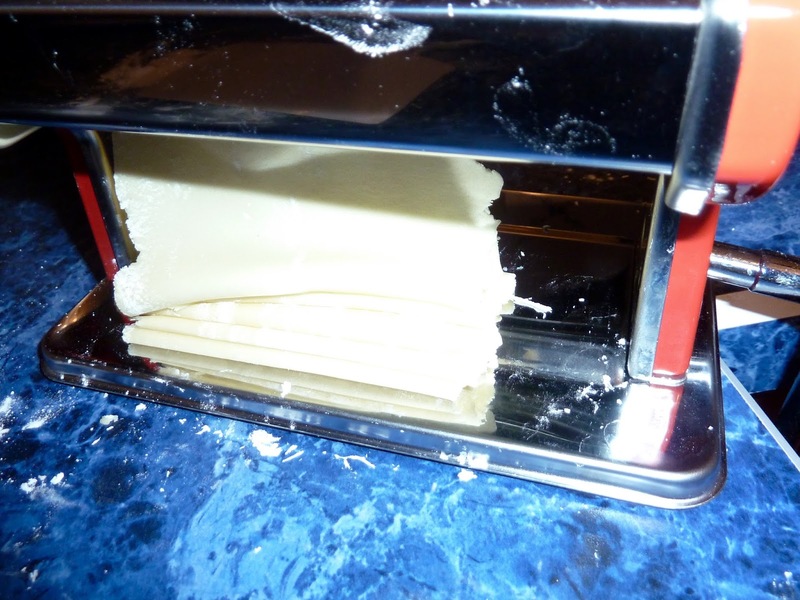 Use the lasagna noodle part (with no cutting blades) place the tip of the dough into the slot of the machine and turn the crank until the dough has run through all the way. Dough after first pass through the machine. 16) Fold the dough into thirds press it lightly and run through the machine again. Repeat once more on the largest setting. Folding the dough into thirds for the second run through the machine. Folded dough going into the machine. 17) Move the dial to the next setting (one narrower) and run the dough through. Turn the dial down again and repeat until the pasta is ⅛ inch thick. The pasta will expand when cooked and be 2-3 times thicker when done. 18) As you roll the dough through the machine with smaller and smaller openings, the rolled out dough gets longer and thinner. At one point I cut the dough in half to make it easier to handle when putting it into the machine. Dough folding at the base of the machine as it gets thinner and longer. 19) Place the rolled out dough on a flour dusted counter or board. Use cookie or biscuit cutters, a ravioli cutter or the rim of a glass to cut out circles of dough. I made two different size circles, one 2½ inches and one 3 inches wide. I used the larger circle for the top of the ravioli. This covered the scoop of filling more easily. Cutting out circles with cookie and biscuit cutters. will fit over the filling and still reach to the edges. 20) Place half of the circles (the smaller ones) in a row and brush with beaten egg. This helps to seal the edges together after the ravioli are filled. My first batch I put the filling on the bottom circle of dough and then brushed around the edges of the circle. Then I realized that it was easier to just brush egg onto the whole bottom circle of dough before putting the filling on top. 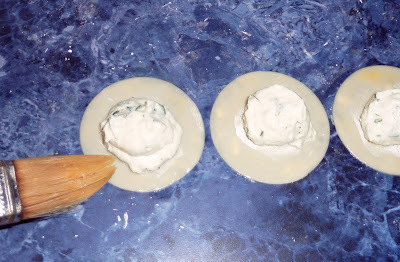 21) Place a scoop of the chilled filling on each circle that has been brushed with egg. Filling scooped onto the smaller circle. to help seal the edges. 22) Cover the filling with a larger circle of dough and press down the edges to seal in the filling. It is best to keep air pockets out of the ravioli to keep them from splitting open while cooking. Circle of dough on top of the filling with edges pressed down. It is smoothed down over the filling to get rid of air pockets. 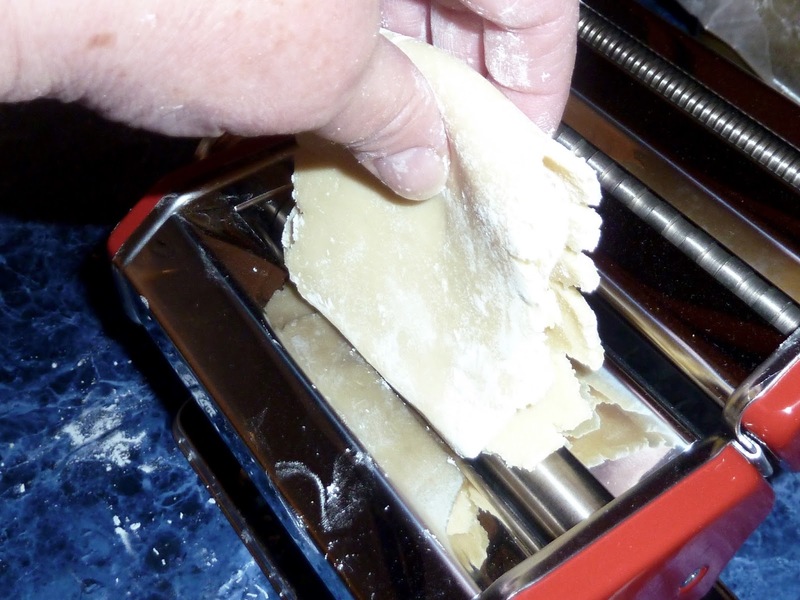 23) Very gently crimp the edges closed with a fork. Repeat the process until all the dough or filling is used. Scraps of dough that are leftover after cutting out the shapes can be kneaded and rolled out again. Gently crippling the edges with a fork. 24) You can also form the dough into pasta shapes of your choice. You can cut them by hand or by attaching a cutting blade attachment to the machine. Noodles can be dried or frozen and stored for later use. Ravioli can be frozen for later use. Line a baking sheet with parchment paper and spread out the ravioli into a single layer and place in the freezer until solid. 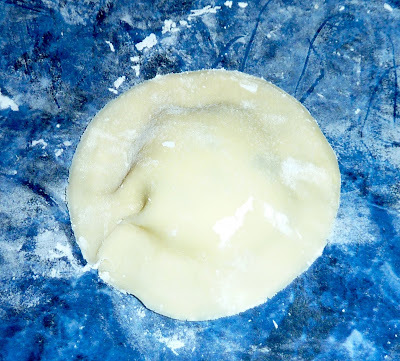 Transfer the frozen ravioli to a plastic container separating layers of ravioli with parchment paper to prevent sticking. 25) When ready to eat them, bring water, that is well salted, to a boil and then lower the heat to a simmer. Place the ravioli, one at a time into the water. How many you can cook at a time will depend upon the size of the pot and the ravioli. Place the ravioli in the pot in a single layer, they should not touch each other. Use a flat spatula to gently scrape the ravioli off of the bottom of the pot if they stick after you put them in. 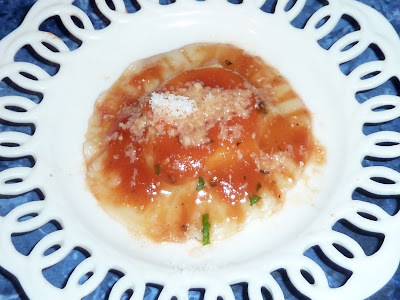 26) Ravioli takes only a few minutes (about 4) to cook in simmering water. When they float to the top they should be done. I usually taste one to check and then cook it longer if it is not done enough for my taste. Frozen ones will take longer to cook. 27) Serve with your favorite sauce and grated cheese. Enjoy! GLUTEN FREE RAVIOLI PASTA - WET INGREDIENTS 3 large + 1 reserved to brush and seal the dough Eggs 1 Tbs. Olive Oil 1-2 Tbs. Warm Water PASTA - DRY INGREDIENTS ¾ cup Sweet Rice Flour (or Brown Rice Flour-fine ground) 1 cup Tapioca Flour ¼ cup Corn Starch (or Potato Starch) ¼ cup Millet Flour (or White Rice Flour-fine ground) 1 ½ tsp. Xanthan Gum RICOTTA CHEESE FILLING INGREDIENTS 16 ounce container Whole Milk Ricotta Cheese 8 ounces Whole Milk Mozzarella Cheese - Grated ¼ cup Grated Romano or Parmesian Cheese ¼ tsp. Sea Salt ¼ tsp. Black Pepper 1 large Egg ¼ cup Fresh Italian (flat) Parsley - finely chopped Directions 1) First make the filling: Combine all the filling ingredients in a bowl and mix well. Cover and let it chill in the fridge for several hours until firm. 2) Next make the pasta: In a large bowl add the dry ingredients and whisk together well. Do not add salt, as this will make the dough tough. It is better to cook the pasta in well salted water. 3) Make a well in the center (you can pile the flour on the counter top and make a deep well also, but I thought the bowl was safer for a first time pasta maker such as myself). 4) In a small bowl mix 3 of the eggs and the oil and pour into the flour well. 5) Mix with a fork. 6) Add the water slowly while mixing it in. All of the flour should be incorporated and the dough should hold together. 7) If too dry and crumbly add additional water a teaspoonful at a time until the dough holds together. 8) If too sticky and wet add a tablespoonful of tapioca flour at a time until the dough is soft and pliable and easily holds together into a ball. 9) Knead the dough, in the large bowl (or on the counter) until it becomes very smooth. Dust with some cornstarch or tapioca starch as needed to keep the dough from sticking to you or the bowl (or counter). When gently pressed between your thumb and index finger the dough should feel like your earlobe. 10) Place the dough into the bowl (after it has been washed and dried) and cover with plastic or a cloth to keep the dough from drying out. Allow the dough to rest at least a half hour before working with it. Resting the dough allows the flours to absorb the moisture and hydrate. 11) After the dough has rested cut the ball into four parts. Take one piece and place on a board or on the counter. Cover the other three pieces to keep them from drying out. 12) Flour the board or counter with corn or tapioca starch. If you have a plastic or metal scraper it will come in handy to free any dough that begins to stick to the surface. 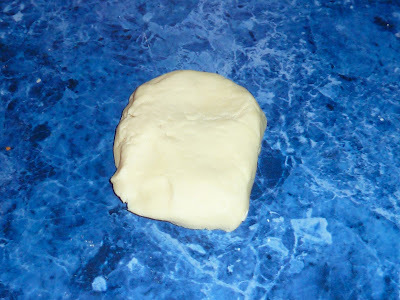 13) Pat the piece of dough into a flat elongated disk and “flour” it well. 14) If you will be rolling out the dough by hand, roll the pasta out on a well “floured” surface until it is ⅛ inch thick. Check frequently to be sure that the dough is not sticking. 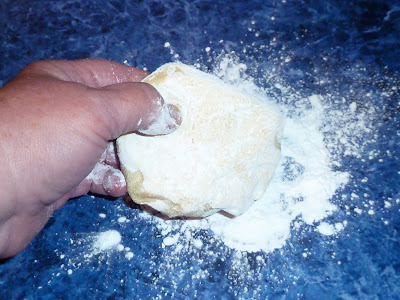 Loosen the dough with a scraper and “flour” with corn or tapioca starch as needed. You should be able to see through the pasta (be able to read print that is underneath) when done. 15) If using a pasta machine, set the dial to the largest opening. Use the lasagna noodle part (with no cutting blades) place the tip of the dough into the slot of the machine and turn the crank until the dough has run through all the way. 16) Fold the dough into thirds press it lightly and run through the machine again. Repeat once more on the largest setting. 17) Move the dial to the next setting (one narrower) and run the dough through. Turn the dial down again and repeat until the pasta is ⅛ inch thick. The pasta will expand when cooked and be 2-3 times thicker when done. 18) As you roll the dough through the machine with smaller and smaller openings, the rolled out dough gets longer and thinner. At one point I cut the dough in half to make it easier to handle when putting it into the machine. 19) Place the rolled out dough on a flour dusted counter or board. Use cookie or biscuit cutters, a ravioli cutter or the rim of a glass to cut out circles of dough. I made two different size circles, one 2½ inches and one 3 inches wide. I used the larger circle for the top of the ravioli. This covered the scoop of filling more easily. 20) Place half of the circles (the smaller ones) in a row and brush with beaten egg. This helps to seal the edges together after the ravioli are filled. My first batch I put the filling on the bottom circle of dough and then brushed around the edges of the circle. Then I realized that it was easier to just brush egg onto the whole bottom circle of dough before putting the filling on top. 21) Place a scoop of the chilled filling on each circle that has been brushed with egg. 22) Cover the filling with a larger circle of dough and press down the edges to seal in the filling. 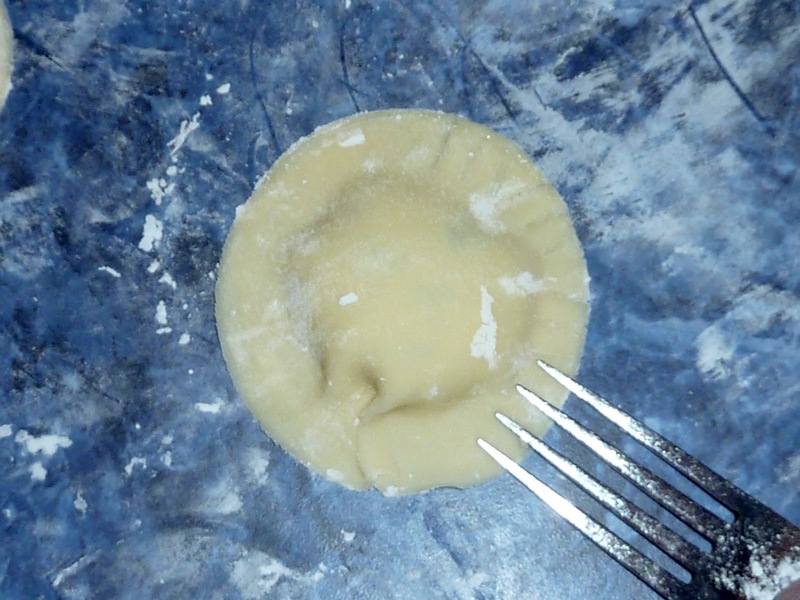 It is best to keep air pockets out of the ravioli to keep them from splitting open while cooking. 23) Very gently crimp the edges closed with a fork. Repeat the process until all the dough or filling is used. Scraps of dough that are leftover after cutting out the shapes can be kneaded and rolled out again. 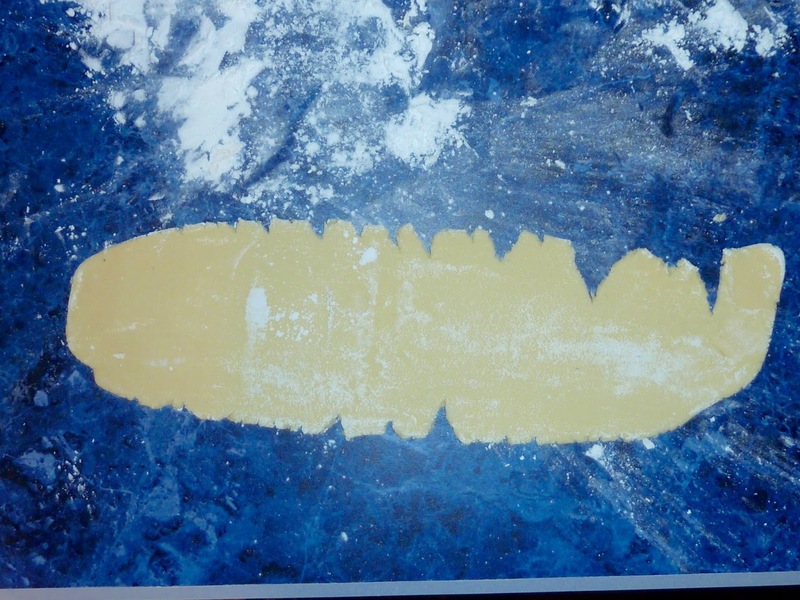 24) You can also form the dough into pasta shapes of your choice. You can cut them by hand or by attaching a cutting blade attachment to the machine. Noodles can be dried or frozen and stored for later use. Ravioli can be frozen for later use. Line a baking sheet with parchment paper and spread out the ravioli into a single layer and place in the freezer until solid. Transfer the frozen ravioli to a plastic container separating layers of ravioli with parchment paper to prevent sticking. 25) When ready to eat them, bring water, that is well salted, to a boil and then lover the heat to a simmer. Place the ravioli, one at a time into the water. How many you can cook at a time will depend upon the size of the pot and the ravioli. Place the ravioli in the pot in a single layer, they should not touch each other. Use a flat spatula to gently scrape the ravioli off of the bottom of the pot if they stick after you put them in. 26) Ravioli take only a few minutes (about 4) to cook in simmering water. When they float to the top they should be done. I usually taste one to check and then cook it longer if it is not done enough for my taste. Frozen ones will take longer to cook. 27) Serve with your favorite sauce and grated cheese. Enjoy!